Taking the advice of C. S. Lewis, we want to help our readers “keep the clean sea breeze of the centuries blowing through our minds,” which, he argued, “can be done only by reading old books.” Continuing our Rediscovering the Forgotten Classics series, we want to survey some forgotten and lesser-known Christian classics. 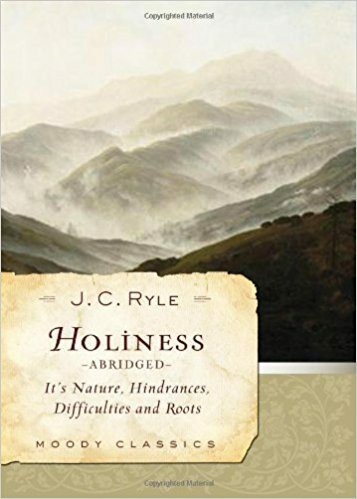 J. C. Ryle’s forgotten classic, Holiness: Its Nature, Hindrances, Difficulties, and Roots, holds the dubious honor of being the only book to ever ruin my workout twice in one day. I picked it up on the way to the gym one afternoon. Students were offered extra credit for reviewing it, so I took the instructor up on his offer and began reading it as soon as I arrived. Before I knew it, an hour had passed and I was hooked. Since I couldn’t put it down, I took it in with me and attempted to read while walking on the treadmill. This proved to be an exercise in futility. The treadmill couldn’t compete with the bishop, so I abandoned my workout after two failed attempts and headed home to spend more time with Ryle. Holiness was originally borne out of controversy. In the second half of the 19th century, evangelicals began embracing new views about the Christian life. Popular holiness teachers—such as William Edwin Boardman, Robert Pearsall Smith, and his wife, Hanna Whitall Smith—urged Christians to embrace a superior form of spiritual life that included a second conversion experience, full salvation, and deliverance from all known sin in this life. A series of popular holiness meetings were held in the mid 1870s, which ultimately gave birth to the Keswick Convention. Many evangelicals were suspicious of this new holiness teaching. To many it appeared to be the old heresy of perfectionism in new garb. At the very least, these new spiritual guides were urging evangelicals to abandon the doctrine of progressive sanctification. Refutations began appearing almost immediately in the evangelical press. Ryle published his own response in 1877, which he enlarged in 1879. It proved to be one of the most extensive critiques of early Keswick spirituality and one of his most popular and enduring works. It went through five editions during his lifetime and has been republished regularly since 1952 at the prompting of Martyn Lloyd-Jones. The enlarged edition of Holiness (1879) contains 20 papers, as well as an excellent introduction and a chapter with extracts from Robert Traill and Thomas Brooks. The first seven chapters are the heart of Holiness and form a book within a book. Here Ryle explains “the real nature of holiness, and the temptations and difficulties which all must expect who follow it.” He begins with sin and human corruption (ch. 1), which is the foundation for a proper understanding holiness. In the next two chapters he treats holiness doctrinally (ch. 2) and practically (ch. 3). In the chapters that follow he argues that the Christian life is, at its very core, a fight (ch. 4); that the cost of following Christ must be counted (ch. 5); and that growth in grace is an essential part of true holiness (ch. 6). He concludes this section with an encouraging and pastorally sensitive discussion of assurance (ch. 7). These seven chapters are Ryle at his best. He manages to be doctrinal and pastoral, convicting and encouraging, systematic but not abstract. At its core, it’s a biblical argument, but he regularly appeals to church history (especially the English Puritans) and church confessions (especially Anglican formularies) to strengthen his position. Above all, Ryle manages to keep the spotlight on Christ and his gospel, even as he encourages self-examination and self-exertion. It’s a phenomenal achievement. The rest of the book consists of a series of holiness-related sermons that are arranged thematically. The first group (chs. 8–12) is a series of character studies that serve, both positively and negatively, as examples for Christians. Perhaps the most interesting is Christ himself. Ryle explains, “He that would be conformed to Christ’s image, and become a Christ-like man, must be constantly studying Christ himself.” Indeed, this is the “one secret of eminent holiness.” The church is the subject of the second and smallest group (chs. 13–14) of sermons. At first glance, this might seem like an odd choice, but Ryle skillfully connects it back to the theme of the book. Real, practical holiness is the leading characteristic of members of the church triumphant, and members of the church militant are urged to make spiritual progress. Moody (2010). 288 pp. $8.20. Christ is the mainspring both of doctrinal and practical Christianity. A right knowledge of Christ is essential to a right knowledge of sanctification as well as justification. He that follows after holiness will make no progress unless he gives to Christ his rightful place. I began the volume with a plain statement about sin. Let me end it with an equally plain statement about Christ. The fact that sermons make up the second half of Holiness doesn’t diminish their value or power in the least. The sermon on Lot’s wife, “A Woman to Be Remembered,” is one of the most convicting treatises I’ve ever read. My personal impressions aside, these sermons illustrate and expand on the truths of the previous section, and they give us insight into how Ryle brought them to bear on his congregation. Read in this light, Holiness instructs us in pastoral theology as well as Christian spirituality. I have had a deep conviction for many years that practical holiness and entire self-consecration to God are not sufficiently attended to by modern Christians in this country. Politics, or controversy, or party spirit, or worldliness have eaten out the heart of lively piety in too many of us. The subject of personal godliness has fallen sadly into the background. The standard of living has become painfully low in many quarters. The immense importance of “adorning the doctrine of God our Savior,” and making it lovely and beautiful by our daily habits and tempers, has been far too much overlooked. Worldly people sometimes complain with reason that “religious” persons, so-called, are not so amiable, and unselfish, and good-natured, as others who make no profession of religion. Yet sanctification, in its place and proportion, is quite as important as justification. Sound Protestant and evangelical doctrine is useless if it is not accompanied by a holy life. It is worse than useless: it does positive harm. It is despised by keen-sighted and shrewd men of the world, as an unreal and hollow thing, and brings religion into contempt. Have we become distracted by politics, controversy, party spirit, and the world? Has our standard of living fallen painfully below the New Testament standard? Have we failed to beautify our profession with our daily habits and tempers? If so, then we still need J. C. Ryle’s Holiness.